(MENAFN - The Conversation) Germany launched its first post-war Himalayan mountaineering expedition to Kanchenjunga – the world's third-highest mountain – in 1929 under the leadership of the celebrated mountaineer Paul Bauer. Its goals were explicitly nationalistic, motivated by a desire to rebuild a faith in German manhood and to finally leave behind the defeat and humiliation experienced in World War I.
Bauer's accounts of the German Kanchenjunga expeditions in 1929 and 1931 are shot through with the language of struggle and military metaphors – the celebration of mountaineering comradeship harking back to the camaraderie of the trenches. The German … soldier has learned to accept everything without hope of any payment other than the awareness of having fulfilled his duty. To do something for its own sake, even when it was hard and bitter, was not foreign to him … for them, the struggle for struggle's sake was nothing new, the loyalty towards the greater objectives a matter of course. Out of this attitude the first German Himalayan expeditions of the post-war era were conceived. Underpinning it all was a sense of German national destiny expressed in the language of racial theory and 'struggle' (kampf). An exhibition, Mountain of Destiny: Kanchenjunga 1929, part of the Kendal Mountain Festival , is on display in Grasmere in the Lake District. The photographs accompanying this article and many more are on display. Mountains as sites of struggle, renunciation and death were increasingly a feature of German culture towards the end of the 19th and early 20th century – the nation's fortunes increasingly seen as being embodied in mountaineering achievement. In 1924, the German film director Arnold Fanck premiered his hugely popular film Mountain of Destiny (Der Berg des Shicksals), a phrase that subsequently became associated with German mountaineering attempts on Nanga Parbat – the ninth-highest peak on Earth. German Himalayan ambitions shifted to Nanga Parbat , in modern-day Pakistan, in 1932 and over the next seven years a further four German expeditions were to attempt Nanga Parbat, leading to the deaths of nine men on the 1934 expedition and 16 men in a single avalanche in 1937. But before the deadly focus of the Nanga Parbat expeditions, two German expeditions in 1929 and 1931 attempted to forge their way to the summit of Kanchenjunga, on the modern India/Nepal border and establish it as the German nation's first Himalayan 'Mountain of Destiny'. If the 1929 German expedition's goal was to establish German mountaineers on the world stage, it also brought them into contact for the first time with the multi-ethnic world of the Himalayas, in particular the ethnic diversity of Sikkim and the region. Lying north of Darjeeling, the Himalayan state of Sikkim at the time was the gateway to Tibet, its foreign policy under the control of a British political agent. The photographs on display in Grasmere capture the distinctive features of indigenous Sikkimese Lepchas , as well as the many Nepalese groups drawn to Darjeeling in search of work. Sherpa and Bhotia high-altitude workers are accorded special attention. In Bauer's books, he frequently named high-altitude workers in photograph captions – unusual for the time, where representations of indigenous expeditionary labour are usually limited to 'types'. One remarkable photograph features the expedition's cook, Tenchedar, seated outside a tent, praying in the Lotus position. The sublimity of this image is underlined by the fact that, all too often, Western mountaineers ignored and belittled the indigenous religious practices of the expeditionary labour force on whom they relied. When one stepped out of the tent in the early morning, there was Tenchedar sitting or standing on his kitchen rock, performing his morning devotions. It made a deep impression on me to see him, amid this region of ice and frost, gazing across in rapture to the distant summit of holy Kanchenjunga lit by the first rays of the sun … It is true that Tenchedar was not quite an ordinary man, he was a leader among his compatriots. A man of astonishing religious knowledge, he wrote and spoke English, he led the religious festivals of the porters at the full moon. What also marks these photographs out as unique is that they were carefully annotated by Edward Oswald Shebbeare , the British transport officer on the 1929 Kanchenjunga expedition. 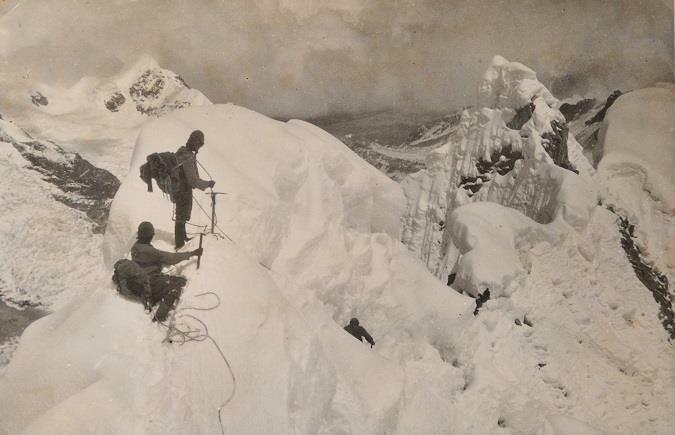 In the albums on display, which were given to Shebbeare by Bauer, the British officer was able to name most of the Sherpas featured in the photographs, preserving their individuality and identity, enabling us to begin to document the hidden histories of indigenous high-altitude labour. In one tender portrait, a group of seven Sherpas – many of them named by Shebbeare, lie in the grass, smiling at the camera and twirling Edelweiss in their hands. The flowers, a symbolic link with the Germans' Bavarian homeland, signal a tranquil moment before the fruitless struggle on the northeast spur of Kanchenjunga. This exhibition captures a unique moment in German Himalayan mountaineering history when German mountaineers first became enchanted by the world of the Himalayas, before the focus on Nanga Parbat consumed so many mountaineering lives and before German and Austrian mountaineering organisations became subsumed into the Nazi Reich. By 1938, Himmler's fascination with Tibet led to the launch of the Schäfer expedition to Sikkim and Tibet, an expedition informed by Nazi racial science that sought to locate the origins of the Aryan race on the Tibetan plateau.